Easy to ride, easy to carry and easy to store. The Brompton is an iconic folding bike that is incredibly practical. This P6R version is fitted with a P type multi position handlebar which offers multiple hand positions for different riding situations. This gives you a variety of different riding positions from upright to tucked. The internal hub gears give you 6 speeds which makes this option ideal for cycling in hilly areas. Rack, mudguards and pump are included. 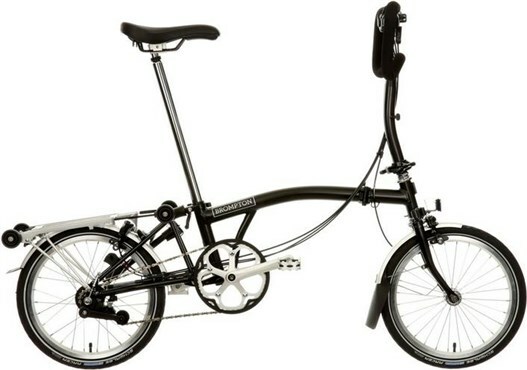 The Brompton P6R Folding Bike is the perfect bicycle for the city. This model features the P type handlebar offering the flexibility of several grip positions, for all types of riding and 6 speed internal hub gears. It also includes mudguards and a rack. P Type – A versatile handlebar, offering the flexibility of several grip positions, for all types of riding.